I thought I’d start a new series called “Busy Mommy Tricks,” or “BMTs,” that I’ll toss out here and there as I discover them. I figured we mommies are in this child-rearing together, regardless of circumstances or lifestyles. So, if I have a trick or two that somebody else might find useful, shouldn’t I share it? That also means that I deeply, DEEPLY covet (oh yes, COVET) your BMTs. If you have one that has made your life happier, please send it to ashleyhofmann@gmail.com. If I share it via blog, you’ll get credit. I promise. Please note, I’m not somebody who thinks you can get through parenthood (or life, for that matter) with a patchwork system of tips and tricks. But you know what? Some tips make things easier. Busy Mommy Trick #1 is the Weekday Day Clothes Organizer. Ta da! I got this idea from a Real Simple article (I use the term “article” loosely, as Real Simple once did a feature-length piece on lip gloss). This organizer has changed my life. 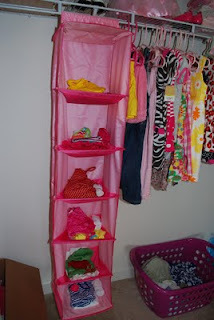 Take a typical sweater organizer that hangs in the closet (I bought this cute pink one at Target for $6.99). Then, on a Sunday night (or whenever—I do Sunday because I have the highest amount of clean laundry then), put outfits in each slot for each day of the week. For example, use the top slot for Monday, the next for Tuesday, and so on. I use the sixth slot for a “back-up” outfit—for example, if Thursday dawns cooler than expected, Charlotte will wear overalls and t-shirt instead of shorts and tank top. I have a few rules that I find useful. First, no outfit can go in a slot unless it is complete. Translation: No putting in a shirt sans the matching skirt based on the assumption that the skirt will be clean by Wednesday. I guarantee that skirt will still be in the laundry come Wednesday, and you will spend precious morning-routine time scrambling to find something else that matches, fits, and is seasonally appropriate. Trust me. Second, I include EVERYTHING that Charlotte will need for a particular outfit: socks, hair doodad (if applicable), sweater (if applicable), swimsuit (if applicable). Everything. This system works fabulously for summertime. Charlotte’s school has an inhumane (to parents) schedule of water days (which are never on the same day each week), “rainbow weeks” (where the kids wear red on Monday, orange on Tuesday, and so on), sports days (represent your favorite [West Coast] team), pajama day, crazy outfit day (Chris can dress her that day), and so on. So, on Sunday I consult the magic summer schedule and set the slots up accordingly. Thus, my child never shows up on green Thursday wearing red (oh, the horror!). Chris LOVES this system. I usually dress Charlotte, but not always. He hates having to pick out her clothes, and with good reason—he’s truly terrible at it. But with the Weekday Clothes Organizer, he knows that NO MATTER WHAT, he just pulls out whatever outfit is on top. He does not think. He does not try to match. He does not try to be creative. He just grabs the prepared outfit and dresses his child. Thus, when I’m out of town, the school doesn’t even know it. Finally, this little system simply saves time. My little family of three has to get out the door by 6:40 a.m. every morning. Every minute I can save, the better. Toddlers thrive on routine, and the less that is negotiable, the better. The less drama, the better. This system provides routine and stymies drama. Whatever is in a slot for a particular day is what Charlotte will wear, period. This allows our mornings to constitute sweet (albeit it well-paced) family time, not cranky chaos. I have time to play peek-a-boo with Charlotte as I dress her, because I’m not frantically going through her dresser for clothes. I can delegate the dressing task to Chris if necessary, because I know that my kid will still be adorably well dressed. I usually have Charlotte help pick out her outfits before the week starts, but I admit that my 18-month-old doesn’t have much of an opinion on clothes—yet. However, I hope to keep including her in the selection process as well as the “non-negotiable” aspect of our morning routine, so that our mornings continue smoothly as she becomes increasingly opinionated. It’s all about routine and knowing expectations, in my view, so as I dress Charlotte, she “helps” by pulling her shirt over her head (such a big girl!) and then puts her jammies into the laundry basket (hooray! Good job!). Don’t get me wrong—I don’t think that every little life detail needs to be pre-planned and non-negotiable, but mornings set the tone for the rest of the day. A lot can go “wrong” (technically, I think it just “goes”) with a toddler in the mix, from unexpected throw-up to unforeseen poop explosions to extra early wake-ups to spills to accidental trips and falls and bumps and bruises. Believe me, you feel far more equipped to deal with the toddler variable of your morning routine when you take dressing drama out of the equation.